Get in the Holiday Spirit with Watters Creek! Kick off the holiday season at Watters Creek at Montgomery Farms on Sat., Nov. 17 at 4:30 p.m. with its annual Light the Night festival. All season long, Watters Creek will offer a line-up of free, family-friendly events and activities that will keep the holiday spirit alive. Light the Night– Nov. 17 from 4:30 to 6:30 p.m. Join Watters Creek for a magical evening to kick off the holiday season and welcome Santa. Starting at 4:30, KISS FM’s Billy the Kidd, the evening’s emcee, will help everyone get into the holiday spirit. Mrs. Claus will be passing out free cookies, and there will be complimentary carriage rides, hot cider, caroling, face painting, and more. The evening’s entertainment includes a performance at 5 p.m. by the Allen Symphony Chorus. They will perform seasonal favorites by the fireplace near The Village Green to keep the “ho-ho-ho” in holidays. Thanks to the Allen Civic Ballet, Watters Creek will also host costumed performers from The Nutcracker. The Allen Arts Alliance will host children’s crafts, Pop-in-Art and an Allen ISD art exhibit at Blue House Too, located near the Horse-Drawn Carriage Rides. At 6:30 p.m. guests will be dazzled when Santa lights up the 30-foot tree, the centerpiece of Watters Creek’s holiday display. The tree leads a 145,000-glittering light display that includes 20 other trees and Santa’s sleigh with reindeer. The lights are synchronized to holiday music and play every hour from 5:30 – 9:30 p.m., daily through New Year’s Day. The evening’s festivities will top off with a spectacular fireworks display. Nov. 17 from 4 to 8 p.m.
Dec. 14, 15, 21, 22 from 6 to 9 p.m.
Dec. 23 from 4 to 7 p.m.
What could be more charming than a cozy horse-drawn carriage ride on a crisp winter evening? 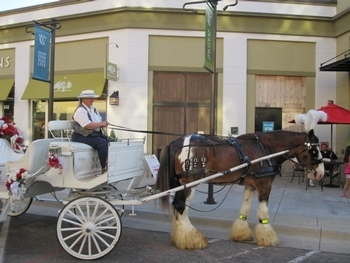 Bring the family or that someone special for a horse-drawn carriage ride around Watters Creek. Carriages hold up to six passengers. Rides are free and on a first-come, first-served basis. Pick-up located by DSW. Weather permitting. Santa Photos – Nov. 18 – Dec. 24 Everyone’s favorite jolly guy will be available to take photos with children and listen to holiday wishes through Christmas Eve. Visit him at his home away from home, located on Village Green Dr. across the street from The Green and next door to Tangerine Salon. Specific dates and times are located on Watters Creek website atwww.watterscreek.com/events. Holiday photo packages start at $25.95. Black Friday Holiday Shopping Promotion, Nov. 23 & 24 Watters Creek is offering a special holiday shopping promotion! Guests will receive a $30 Watters Creek gift card when they spend $150 at the shopping center on Black Friday, Nov. 23 from 8 a.m. – 11 a.m. Guests receive a $15 gift card from 11 a.m. to 6 p.m. on Nov. 23 and until 6 p.m. on Nov. 24, with $150 in same-day Watters Creek receipts. To obtain the gift cards, guests should bring their same-day receipts (as proof of purchase) to Guest Services located in the breezeway between The Cellar and Pure Barre on Village Green Drive. Gift cards are available while supplies last. Limit one gift card, per person, per day. Excludes grocery and gift card receipts. Other restrictions may apply. A Very Jazzy Christmas, Nov. 23 – Dec. 22 Enjoy the holiday music of Eddie Crocetti Jazz from Nov. 23 through Dec. 22. The jazz duo will be playing and entertaining guests every Friday from 5:30-7:30 p.m. and Saturday from 1-3 p.m. in front of Vera Bradley on Watters Creek Dr. In case of inclement weather, Jazzy Christmas will move inside Frogg Coffee Bar & Creperie. Santa Paws, Pet Photos with Santa – Nov. 26 and Dec 3 & 10,5 – 8 p.m. Four-legged friends will have their own special time for photos with Santa. Dogs and cats must always be leashed or kept in an appropriate carrier while at Watters Creek. $5.00 from the sale of each photo package will be donated to Animal Rescue Crusaders of Texas (ARC). Trees for Troops – Nov. 30 and Dec. 1, 2 – 6 p.m. Make this holiday season special for the men and women serving our country as Watters Creek donates Christmas trees to the Trees for Troops program on behalf of the Allen Community. Visit the Trees for Troops tent to write a note of appreciation that will be attached to a Christmas tree and received by a service member or family. Our gift to you – Dec. 3 – 21, Weekdays 8:30 a.m. to 5:30 p.m. For an extra treat this year, guests purchasing three or more Watters Creek gift cards will receive a $10 gift card for free! Watters Creek gift cards are available in increments of $10 up to $500 and can be redeemed at all Watters Creek retail and restaurant locations. Gift cards are available at Guest Services at 970 Garden Park Dr, located in the breezeway between The Cellar and Pure Barre. Elves, Inc. – Dec. 6, 13, 20, 10 a.m. – Noon AND 5 – 7 p.m. Located at Blue House Too, the Allen Arts Alliance space on the south end of Watters Creek Blvd., Elves, Inc. offers fun holiday craft projects each Thursday in Dec. Kids can participate in creating their own special holiday craft project. It’s open to preschool ages through elementary and is free to participate. Merry Tuba Christmas (presented by the Allen Philharmonic) – Dec. 16, 2:30 p.m. Come watch an assortment of tuba players play Christmas carols and other crowd favorites on The Green on Sun., Dec. 16 at 2:30 p.m. Tubists of all ages will participate and fill the green with the sound of low brass. Spectators are encouraged to sing along with the Christmas carols and holiday favorites. The musicians will be conducted by Jeff Baker, principal Tuba with the Allen Philharmonic. Conceived by tuba virtuoso Harvey Phillips to honor his teacher, the late William J. Bell (Born Christmas Day, 1902), the first Tuba Christmas was presented at Rockefeller Center in 1974. This unusual Christmas tradition is firmly established in more than 200 cities around the world. Christmas Eve on the Green – Dec. 24, 5:30 p.m. Celebrate Christmas Eve at Watters Creek by singing Christmas carols by candlelight. Join the Tangible Grace Fellowship Church as they bring Merry Christmas Eve on The Green. Music starts at 5:30 p.m. and runs till around 6:15 p.m.
Free valet on weekends Watters Creek offers free valet to all customers Friday and Saturday from 5 – 11 p.m. throughout the year. Valet is located on Garden Park across from The Blue Fish, and on Village Green Dr. in front of Menchie’s Frozen Yogurt. Visit the Watters Creek website at http://www.watterscreek.com or follow the shopping center on Facebook, Twitter andInstagram. Watters Creek is located at the intersection of US 75 at Bethany Drive in the heart of Allen, Texas. For more information, call 972-747-8000 or visit www.watterscreek.com.